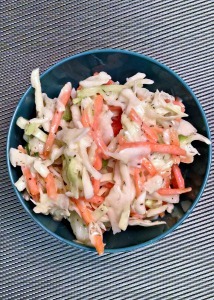 My Green Onion Coleslaw, also posted as a guest post on Mom’s Test Kitchen, is kicked up with fresh green onion flavor. 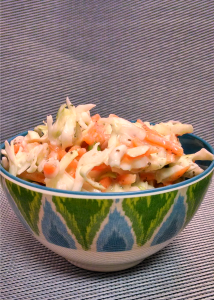 Combined with the sweet and tart slaw dressing, it’s a refreshing and delicious take on traditional coleslaw. It’s cold out. I mean, it’s been really cold out. Walking Missy in the morning has been down right freezing. Like, take your breath away freezing. At least for this part of the woods. I know there are other parts of the country that have had much colder weather, but it’s all relative. They’re colder than here doesn’t feel colder than here. Make sense? Okay. I mean, if you’re used to below freezing temps in winter, then a bit father below freezing is just as cold as the below freezing is here. Yeah. I ‘m just not splaining it right. When it’s THAT cold, I always think of warmer places, warmer weather, which always leads me to warmer food. Cause I’m all the about the food. And after my birthday dinner of barbecue ribs and coleslaw, I really wanted to try to recreate the coleslaw. It was really tasty!! I’m from the South. Enough said. I’m very particular about how my slaw is made. However, this slaw, was WOW! AH-mazing! Holy cow!! 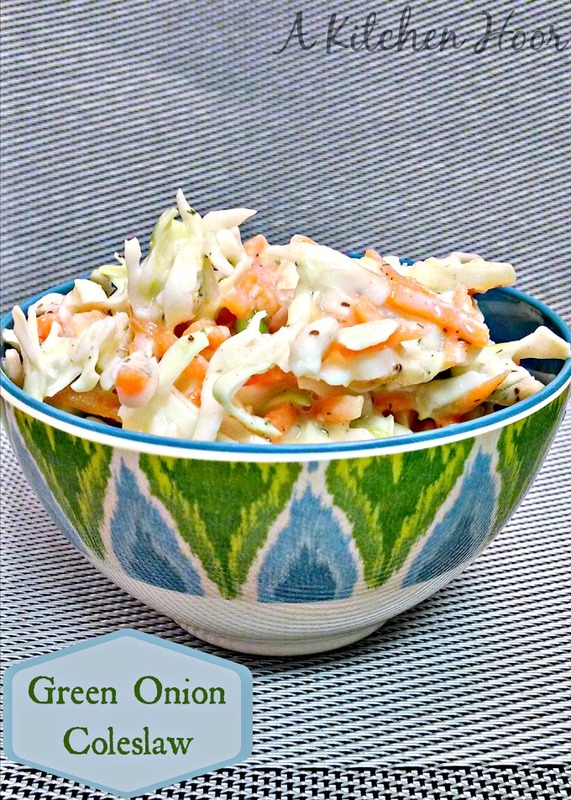 I have to try to make this slaw. It was creamy, tasty, deliciousness that was the perfect side dish to the melt-in-your-mouth ribs on the plate. It wasn’t overly sweet, it wasn’t full of pickles or vinegar. It was… perfect. Since S isn’t a huge fan of vinegar, I’ve tried to use one that’s not quite to potent. This lead to a while new world of coleslaw. This is delicious. I will definitely be making this again when we have the barbecue chicken that’s in the freezer. It’s good enough for a repeater. Place mayonnaise in a small bowl. Add enough vinegar to thin the mayonnaise to your desired consistency. Add next 5 ingredients and stir to combine. Toss the cabbage, carrots, and green onions in a large mixing bowl. Top with dressing and toss to combine. Allow to rest 5 to 10 minutes before serving.